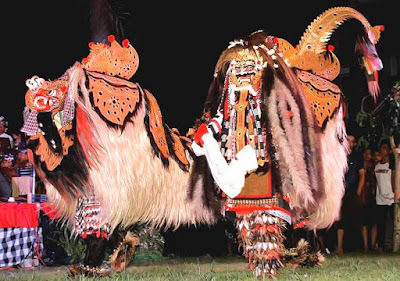 Bali will host a unique festival, Barong Festival 2016 in Denpasar Cultural Park, 22 to January 23, to support the barong ket, one dances in Bali which has been recognized as an intangible world cultural heritage by UNESCO. The number of participants is 54 barong, which consists of 19 dancers barong buntut, and 35 dancers barong ket. The activities can take place on an ongoing basis every January. Although art barong ket has received international recognition, the type of dance it must still be developed and maintained continuity. Pregina Art & Showbiz Bali to support these activities which cooperates with Seka Kubu Barong to hold Bali Barong Festival 2016 in Denpasar Cultural Park. The festival will be an interesting thing, because it is something new and nature conservation for the sets. Barong in Bali mythology is the king of the spirits that symbolize of good. Figure as symbolized by a lion protector. Barong have enemy named Rangda and they both are often involved in a battle. The thrill of battle this is brought into a show at the same time barong Bali tourist attraction. The excitement of the attractions you can see in Bali Barong Festival event held at Taman Budaya Art Center Denpasar Bali on 22-23 January 2016. The event was titled "Regeneration Competition" Bapang Barong & Makendang. Categories barong contested among others Barong Ket, Barong buntut and makendang.